Rhinoplasty, or nose reshaping, is a cosmetic surgery procedure which affects the appearance, structure and function of the nose. The nose can be remodelled to become bigger or smaller, to reshape its tip, decrease the width of the nostrils or change the angle between the upper lip and nose. Rhinoplasty helps to correct birth defects and nose injuries, and helps people who have problems with breathing. starting from €111 per month. Apply here. If you are not content with your appearance or suffer from a nose related condition, rhinoplasty can solve your problems. Are you a suitable patient for rhinoplasty? The best candidates for nose reshaping surgery are people who wish to improve the appearance of their nose, but do not expect to have a perfect nose. In addition to realistic expectations, good health and psychological stability are important in a patient considering rhinoplasty. The best candidate for nose surgery is also at least 18 years old, because development of the nose has ended. No unique universal nose surgery method exists which responds to the needs of every patient. Nose reshaping is performed differently for every patient, adjusting the surgery according to the patient’s needs. 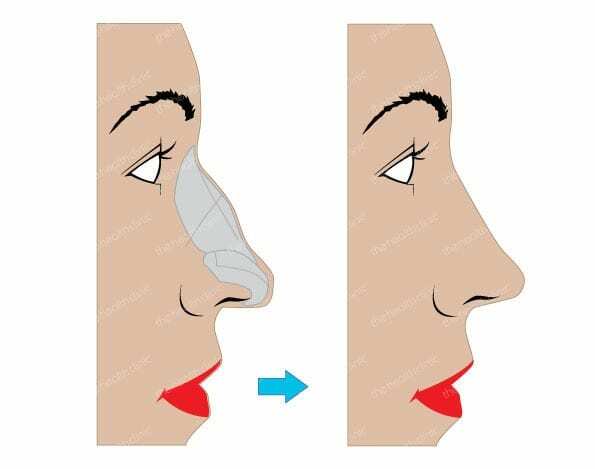 There are two possible access points to the nose, in order to change its shape: the closed and open method. In closed rhinoplasty, the incision is made in the nose, the skin and subdermal tissues are separated from the underlying structures to model the skeleton from bones and cartilage – the position of the bones is modified, cartilage is added, bones are removed, etc. In the open method, an incision is made in the columella skin (between nostrils), postoperative scars are very small. If the patient also has problems with breathing through the nose, this can be corrected intranasally during the same procedure (septoplasty). Usually the procedure is performed under general anaesthesia. How to prepare for rhinoplasty surgery? To get the best results from the nose correction, it is very important to follow your doctor’s advice. This may include the following. • Avoid physical exercises such as training, yoga, etc. Additionally, do not wear glasses or sunglasses for at least 4 weeks after the surgery to avoid excess pressure on your nose. Avoid direct sunlight for at least 3 months – too much sun may cause persistent discoloration of the skin. Very small changes in the structure of your nose, often only measured in millimetres, may greatly change your nose and all of the face. The development of the final result may take up to an entire year, and your nose may change slightly during that time. For the most part, patients are very satisfied with the job of an experienced surgeon. Rhinoplasty surgery is performed by Dr. Aet Saarts, who is one of the leading nose surgeons in Estonia. Ask for more information or book a time.